Half-price offer:"The Embodied Spirituality of NVC" DVD set available here. The primary focus of the LIFE program is to develop awareness of the consciousness of “the living energy of needs” or “the beauty of needs.” This is the foundational base for Living Compassion and is core to living and integrating NVC into life. The deepening work of the LIFE program is designed to establish a clear pathway to first identifying, then experiencing and cultivating this consciousness. This work supports an embodied spirituality and a way to engage in a living practice in our everyday, moment-to-moment living. Processes and tools are offered that serve this integration and development. Building and developing a strong and clear foundation is a basis for applying the NVC process in our lives. Without this inner foundation, it is easier to practice NVC as a mechanical or rote process, or to get stuck in jackal reactivity without the living quality of needs. The major aspect to developing a foundational consciousness is the ability to transform our life-alienating thinking and reactivity to the more life serving consciousness of authenticity and presence. The LIFE program is intended for people who have intermediate to advanced skills in NVC. Participants are expected to already have the ability to apply basic skills of expressing honestly, self-empathy and empathizing with others. There is some priority given in the application process to people who are already teaching or sharing NVC. The LIFE program is a two-year commitment. 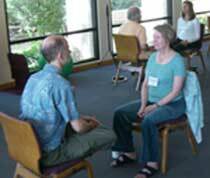 Each year, there are two, seven day retreats. In between the retreats, there are teleconferences and an individual phone/Skype session with Robert. There is also on-going, peer-facilitated telephone/Skype sessions to support the work in the months between retreats. There is a process of application to the program. For each LIFE group, the aim is to have approximately 24 group members. Each class size is limited to ensure a quality of learning that goes with smaller groups. To receive announcement of the program or to request an application, send your request via email to Elizabeth at elizabeth@living-compassion.org. Click on this link for the LIFE Program Curriculum.